The first thing that got our attention was the protests and disagreement on social media. Then came the articles that managed to get a place on the pages of the paid independent media. 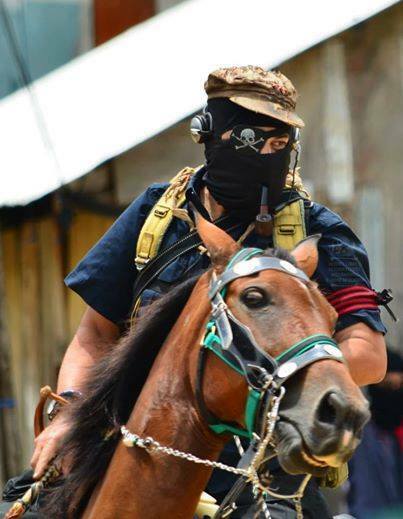 So a team of Tercios Compas [Zapatista Media] were sent to confirm or dismiss the reports. In the image you capture, you can find everything except coherence: supposed urban construction projects, carried out without official announcement, traffic signals, or alternative routes; streets that only exist in name on a street sign; large spectacles where that “famous blonde” Manuel Velasco Coello, or one of his accomplices, reiterate that they do in fact honour their word, while the principal transportation routes in the city were or are destroyed. What’s more, the only small businesses that have survived this urban war are the tyre companies, muffler distributors, and mechanic shops. The road projects that have been finished are flanked by “for sale” and “for rent” signs, as well as by abandoned old buildings and shiny new ones. “We carried out the ridiculous. We were complaining that the teachers’ marches and blockades were lowering our sales, and it turns out that it was the government’s construction projects that bankrupted us. Look, this whole circuit here was made up of small and medium-sized businesses and all of them went out of business. Now there are foreign businesses and tons of chain stores. The city literally shut down, as if it was under siege, but it wasn’t the teachers or the Zapatistas who did it, it was the government. Sure, the teachers maintained their blockades for a few hours, a day, a week. But the government shut off transit throughout the city for almost a year and in some places you still can’t get through. Tell me, what business or company can withstand that for such a long time? Only the big ones, those that have the capital to survive the drop in sales. Or those who went so deeply into debt that now they are working to pay the bank back for the loan it gave them so that they could work. Yes, it’s absurd. Now they work to pay the bank that loaned them the money so they could work in order to pay it back. We had to close up shop, fire our workers, and sell the business. Look, that place where there is now a franchise, that belonged to my family for decades. 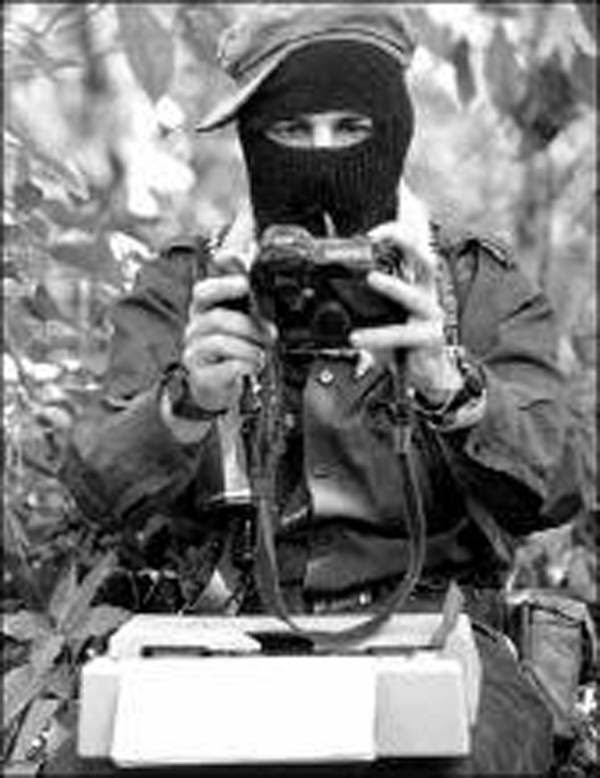 They always told us we should fear those who rebelled, and the teachers, then the Zapatistas, then the teachers again, always the teachers. That all those people wanted to take what was ours, break things, loot our businesses, ruin us—that’s what they told us. And it turns out that the ones who ended up robbing us, breaking us (the speaker gestures to the broken-up street, worse than a dirt road), looting us, and ruining us were the governments themselves. It doesn’t even matter which party. Around here they have said they’re from the PRI, the PAN, the PRD, the Green Ecology Party, whatever they feel like being. But it’s always the same people: the Sabines, the Velascos, the Albores, the Orantes. One day they’re one color and the next day another color. And we like fools were putting up our signs saying “We insist the “Rule of Law” be applied so that the government could exercise repression while alleging that we had demanded it. And it was that damned “Rule of Law” that ended up screwing us over! And if we were to denounce that? Where would we do so? Where, if the local media are totally bought off and the national media also get their part of the payoff? Yes, here and there there’s a local outlet that takes a risk and publishes something on this, but they can do little to nothing against the big media, which aren’t really that big and are merely the spokespeople for the government currently in office: before they were Alboristas, later Mendeguchiistas, then Sabinistas, and now they are Velasquistas, and tomorrow whatever but they are and always will be shameless. No, no problem at all, what does it matter to me if you say that I am from the CANACO, if the real problem I have now is how to pay the debts I have to the bank. I sold everything and it still isn’t enough, and there isn’t anything left to draw from. We were so afraid of the poor and it was the rich and the government that screwed us over. In effect, the capital city changed its face: instead of the original businesses that were here, now wherever you look there are franchise brands and large companies. In the commercial centres, the small businesses with a small storefront close almost immediately and are replaced by others. At every intersection there is an army of windshield-washers and sidewalk vendors of everything imaginable, taking turns knocking on the passing vehicles asking for something, even just a coin. This image is repeated across other Chiapan cities… and across the rest of the urban scene of the country. Energy reform, for example, is but the bugle call for the launch of a mad dash toward dispossession. And we’re not talking here only about those territories under the care of the originary peoples. We are also referring to pension funds, that is, the pensions of the working class. The target of the urban war that has modified the “face” of the cities is not only land plots and buildings. Services make up the main course. The provisioning of potable water is managed with calculating perversity: scarcity feeds the emergence of water pipe companies which displace the traditional companies and gradually monopolize the market. And just as with water, so it goes with transportation, communications, security, and even trash collection. The process of urbanization, which would be slow if it were rational, is now madness. It is as if a war were under way, and instead of armoured vehicles, it is the construction machinery that, paradoxically, destroys. If a logical reasoning would be to create adequate services and then urbanize, the reality is the contrary: urbanize and later see about services. In this option, the same names of the political class appear, claiming experience and maturity, but under different initials. And since the decisions to be made are over colours and promises, well then if red failed, let’s try blue, or green, or brown, or orange, or whatever old pattern now appears dressed as the new. For this option as survival plan, there are calendars: each calendar period you can try to change colours; maybe this time it will work. But life continues its course and one’s basic needs don’t subordinate themselves to the electoral calendar. So you follow whoever offers to resolve things most immediately, even though this means the destruction of your future. So you decide to participate, or not. With passion alight, you make one colour yours as if it were a sports team. You join the game, yelling and shouting your head off. The game ends, with its winners and losers, and life goes on. Until the next game. This isn’t about judging, but about understanding. And here is a problem that requires critical thought, now not only an effort at scientific thought, but rather one aimed at defining a strategy of resistance, of survival, of life. A good part of the world thinks this problem has been located in public administration. And the almost unanimous diagnosis is that it is an issue of corruption in the governmental apparatus. When the representatives of some European state, let’s say Greece, sit down to talk to Madam Angela Merkel, are they talking to the Bundestaq or to the International Monetary Fund… or with the European Central Bank… or with the European Commission… or with all four… or with none of the above? What were its functions, its place, its sphere of influence, its areas of interest? Oh yes, I’m sorry, but this thing of “the State” is much more complicated than the twisted plot lines of Game of Thrones.